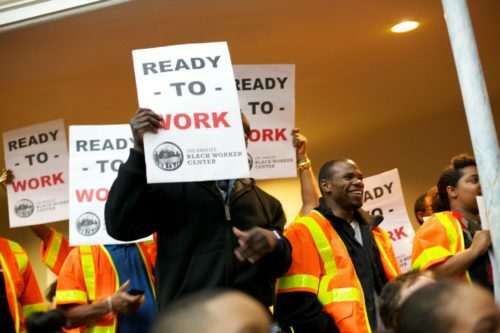 In 2012, the LABWC successfully ensured that the Los Angeles County MTA’s five-year master Project Labor Agreement included specific diversity language that would establish: 1) broader criteria for the definition of disadvantaged workers, such as those emancipated from foster care; 2) a requirement that disadvantaged workers be defined by at least two criteria, to better identify workers who have traditionally been shut out of the economy; and 3) federal civil rights and equal opportunity language (Executive Order 11246), which includes affirmative action enforcement and monitoring. This landmark federal civil rights and equal opportunity language, including enforcement and monitoring, would be applied to both locally and federally funded projects covered by the agreement. As a result of these successes, more than a dozen of LABWC recruits have enrolled in union pre-apprenticeship programs, union summer helper programs, and been placed into stable union construction careers.